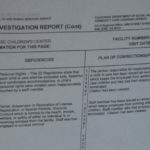 A former male employee of UC Santa Cruz Early Education Services (EES), or campus day care services, allegedly engaged “in conduct which is incompatible with being present in a licensed child care facility based on allegations of inappropriate touching,” according to an email sent on April 14 by executive vice chancellor (EVC) Alison Galloway to families that use EES. The employee under investigation was terminated on May 3, 2014. Subsequently, Chancellor George Blumenthal has ordered a full program review of EES. In addition, an email from EVC Galloway was sent to parents on June 5 that included the CCL investigation document detailing criminal allegations of “sexual abuse” and a “violation of personal rights” against the former employee, which he admitted to, according to the document. 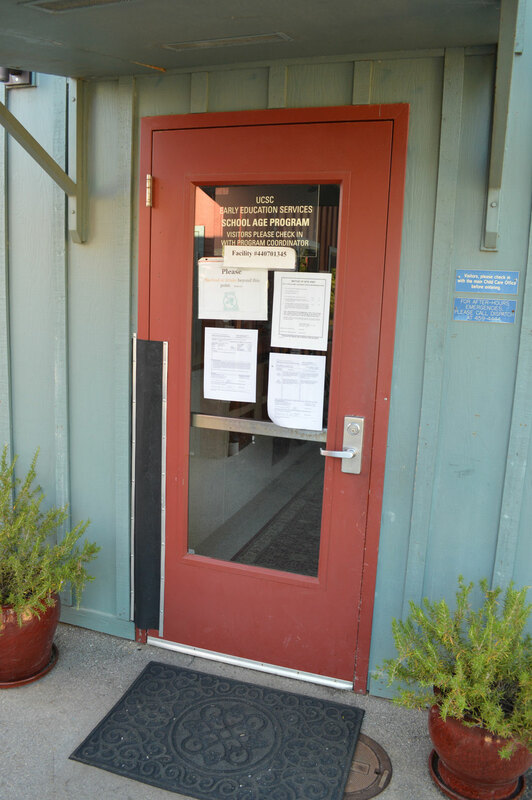 The door of UC Santa Cruz’s Early Education Services with a notice detailing the allegations against a former EES teacher. 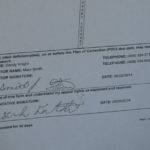 The notice was placed on May 28 and remained on the door for 30 days. Photo by Jayden Norris. Currently, the UC Santa Cruz Police Department is working with the Santa Cruz County District Attorney on the ongoing criminal investigation, but “there have been no arrests to date” according to recently retired UCSC director of public affairs Jim Burns. Burns said following the end of the CCL investigation, the two citations given by CCL were cleared because the university took the required action of terminating the employee under investigation. According to the UCSC Police Department daily crime log and fire log, an incident of Lewd and Lascivious Acts with a child under 14 was reported at 2:54 p.m. on Oct. 22, 2013. The location of the crime was reported as EES and took place on October 16, 2013, between the hours of 9 a.m. and 4 p.m. The employee under investigation was subsequently placed on leave from the center on October 24, 2013, said UCSC senior publicist Guy Lasnier. 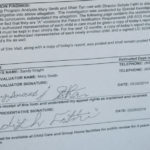 While the incident was reported in October, parents of children enrolled in EES were first notified of this investigation on April 14 by an email from EVC Galloway. “We removed the employee from the center five months before we received [Community Care] Licensing’s order to do so, we have tried very hard to keep the parents informed in a manner that doesn’t compromise ongoing investigations and we have made counseling and other services readily available to families,” EVC Galloway said to City on a Hill Press via email. The email sent to EES parents on April 14 detailed the process that began after a parent notified the center concerning the employee’s “behavior” around their child. From there, the center contacted the UCSC Police Department, which then notified the California Department of Social Services, as well as CCL and Santa Cruz County Child Protective Services. A parent and second-year transfer student, who preferred to remain anonymous, had children enrolled in EES this past school year. This source said that while the situation at the day care is “scary,” there were no other day care service options available for the source during the school year. The anonymous source also expressed concern about how parents were informed of the investigation. “[The teacher] had been gone for months and months and months so why didn’t you tell us this a long time ago? I mean investigations happen, and I understand they can’t exactly let out information right away, but at the same time that’s kind of scary,” the anonymous source said. On May 1, EVC Galloway also held a third meeting to meet with EES parents who formerly had children at the center. For parents who could not make this in-person meeting, an online meeting was held on May 2. Another anonymous source, a student and single parent whose child goes to EES, said they are heartbroken over the news of the investigation. “We’re in a lot of pain right now,” this source said. This source removed his/her child from EES for a period of time after the investigation was announced, but found going without child care for the rest of the quarter was not possible, so he/she returned the child to EES. “A lot of us [parents] are struggling parents financially and we don’t know what to do,” the source said. In response to this exclusion from “working with day care children,” the employee under investigation wrote a letter appealing this decision and sent it to the Childcare Program administrative office on April 14. This letter was provided in a larger document sent in an email to the families with children at EES on June 5. EVC Galloway held a fourth in-person meeting with EES parents on June 10 to discuss the CCL review sent to parents. Former EES director Sohyla Fathi did not comment on the investigation and directed further inquiries to the UCSC Police Department. However, because the investigation is ongoing, the UCSC Police Department was unable to comment at this time. The Santa Cruz District Attorney’s office was also unable to comment but confirmed the investigation is pending. Although the CCL investigation concluded, Burns said Chancellor Blumenthal ordered a full program review of EES to be conducted by Praesidium. This program review is currently taking place and is expected to be completed by the end of July. Burns said the findings of the review will subsequently be shared with EES parents. Editors note: For this article, City on a Hill Press chose to exclude the name of the employee since the criminal investigation is ongoing and no charges have been filed at this time.